Each time you make a reservation through this website, your reservation is made directly with Chroma Pelion Villas. As such, you are guaranteed the lowest possible rate, unlike reservations made through third party systems (whose prices include the given platform’s commission). 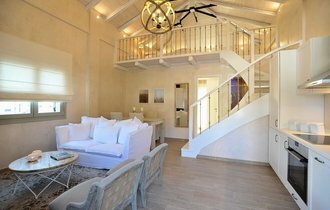 To view rates, availability and make an online reservation directly with Chroma Pelion Villas click here! 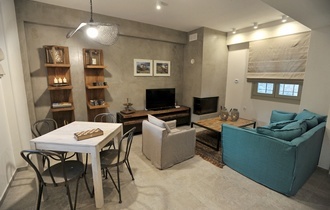 Chroma Pelion Villas is found at an exceptional area at Kato Gazea, Pelion. It consists of six independent, fully furnished, luxurious villas at a distance of 20m (~22yds) from the sea. All villas are independent, with their own private entrance and private balcony, while a common area is the swimming pool in the yard. The casual-chic décor indoors, creates a relaxing mood, assigning each residence its own individual colour, while the exterior has pronounced elements of Pelian architecture. 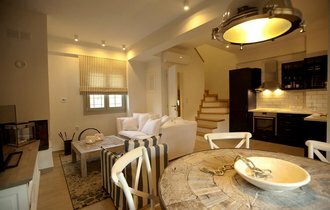 The defining characteristics of Chroma Pelion Villas are luxury and privacy. Flight Information: Chroma Villas informs you that for the new year 2019, the following flights are planned by departure city to Aghialos Airport in Volos - Pelion. From LONDON to Volos with EASYJET from 01/06/2019-31/08/2019 * 1 flight per week. From LONDON to Volos with ENTERAIR from mid May to early October * 1 flight per week. From TEL AVIV to Volos with TUS (mid-July to end September) * 2 flights per week. * (The exact dates of the flights have not yet been finalized and will inform you in time). This villa features an open plan area which has a fully equipped kitchen, dining room and sitting room with a fireplace. 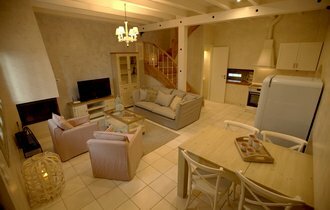 On the lower level there is a bedroom with a double bed, while on the loft there is a double bed which can be separated into two single beds. It provides two big verandas, both with a view of the mountain and one with a view of the pool. The villa features a veranda with a mountain and sea view. 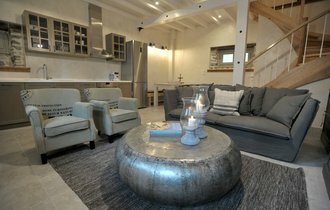 On the lower level there is a continuous space with a fully equipped kitchen, dining room and living room with a fireplace and bathroom. On the upper level there are 2 bedrooms with double beds and a bathroom. The villa features a veranda with a view of the mountain and the sea. 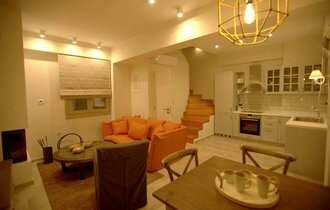 On the lower level there is a continuous space with a fully equipped kitchen, dining room, sitting room with fireplace and bathroom. On the upper level there are 2 spacious bedrooms with double beds, which can be turned into two single beds and a WC. The villa features a veranda with a view of the mountain and the sea. On the lower level there is a continuous space with a fully equipped kitchen, dining room, sitting room and bathroom. On the upper level there are 2 spacious bedrooms with double beds, with the choice of one being made into two single beds, and a WC.